Every time we take a new step to the application integration we find stoppers, but there are many technologies that help us support a vision. When we are considering an integration strategy there are two main paradigms to support it, SOA (Service oriented architecture) and EDA (Event Driven Architecture). Both paradigms represent a new situation that the areas of Development and Operations area must face. Sharing data is no longer a concurrence problem over the data base, neither it is an over night replication; now every process must be considered as a potencial user that needs data managed by other application. Administration of the integration Impact . Does a transactional system have the responsibility over the system´s needs? Is the consumer responsible for the use of the services he does? Can it be managed by the governance? Now, it could be simple to ask developers to design, build and support a second data structure… (you could try, although I´m not so sure they will do it) but what´s up with legacy applications or applications not developed by us? Modifying them could be very costly or even impossible but we can take advantage of integration interfaces or extension points which let us use…. events!!! How can we apply this pattern? We can extend the pattern and delegate the responsibility on another application. This application should be focused on the roll of a service provider and its design should prioritize scalability. How can we have scalability in the data layer? Betting on innovation using state of the art technologies like In-memory databases for whom scalability is the fortress. In my experience, I used Infinispan. It has a small learning curve and it is easy to scale on it. The latest versions are very robust and finally, bugs on the transaction manager and locks problems in the synchronization between instances have been fixed. This allows us to have a database with full horizontal scalability with a data design oriented for service provision. Temporal inconsistence from the source. We need to manage the latency between the original transaction and the time needed to process the event. Infispan is an in-memory database under the key/value scheme. Its power resides in the access speed to the data, not only because of the in-memory feature, but also for the direct access by keyword. Access through keyword represents a clear advantage if the keyword search criteria for the services we expose match those ones used when storing the data. Infinispan can be used both as an API or as a server. In this type of architecture, we see ISPN as a concurrence point of many applications where one writes and the rest read, for there are a series of services exposing the information. More flexibility for the processing of combined data. The processing capacity and storing scalate together. There is no need to overload the ESB for data processing or generate an extra layer. Flexibility in the infrastructure scalability. Problems, restarting or deployment of new versions of the service layers are events completely independent from the persistence layer in Infinispan. If we are dealing with a commercial application, we need to analyze its integration points. In case of not having any, we still have the possibility (although not pleasant) of implementing a mechanism of pooling the database (trigger, pooling daemon, etc) to retrieve any changes. How can we guarantee the notification of the totality of the changes? We can make the persistence of the event part of the transaction. We can define some mechanisms for manual/automatic retrieval for the persistence of the event. It can be replicated or distributed, depending on the amount of data to store, the robustness we want to confer to it and the data reloading time. In spite of looking for alternatives, I always come to the same conclusion, the best way of implementing the Event Bus is by way of a JMS platform. The Bus must act as a buffer of events allowing a certain level of elasticity for the consumers and achieving both that the event persistence has a minimum impact on the performance and resource cost for the producer. If the Event Bus is not available, the transaction can’t take place. More responsibilities for the application. Whichever strategy we choose, the objective is to guarantee a higher platform availability and scalability. This will allow to support an increase in the traffic through the platform and its availability time. Public-Subscriber scheme: It allows scalability in the message traffic and permits incorporation of consumers without restarting or configuring the infrastructure. Durable Subscribers: this feature guarentees the preservation of the messages until the consumer retrieves them. Persistent Messages: this feature preserves the messages even in the event of platform restart. The strategy consists in putting together a pub-sub scheme where a publisher sends a message on a specific topic and n subscribers retrieve it. This allows scalability with the subscribers at the time of registry when they subscribe to the topic with the same client ID. Being persistent allows us to guarantee the arrival of the message. The Application integration through services and/or events generates impact problems among applications. Responsibility segregation is a good strategy at the time of facing the trouble of administrating the integration impact. In-memory databases and JMS are technologies that provide the adequate functionalities for the implementation of a CQRS architecture, allow to decouple consumers from producers and have structures designed for query. My personal experience with Infinispan for information retrieval services and JBoss A-MQ for messaging administration has been more than satisfactory, allowing me to have a 7×24 infraestructure with message delivery guaranty and to provide high traffic services, reducing response times by 10-100 times. Cuándo avanzamos hacia la integración de sistemas son muchas las barreras con las cuales nos encontramos y son muchas las tecnologías a las cuales podemos acudir para dar sustento a la estrategia. Los paradigmas ideales sobre el cuál se basa una estrategia de integración son SOA (Service oriented architecture) y EDA (Event Driven Architecture). Ambos paradigmas presentan una situación nueva a la cuál administradores y desarrolladores deben enfrentarse. Compartir datos ya no es concurrir en una base de datos, replicaciones nocturnas o procesar ETLs. Ahora cuando desarrollo mi aplicación debo pensar también que mi universo de usuarios se expande a todos los procesos de la compañía que necesitan de la información administrada por mí. La administración del impacto de la integración. ¿Es responsabilidad de un transaccional servir de sustento a otro para brindarle servicio? ¿Es la aplicación consumidora del servicio responsable del uso que hace? ¿Puede el gobierno controlar y limitar eso? Independientemente de que el gobierno permita establecer reglas de convivencia existe la posibilidad de deslindar esas responsabilidades. Casualmente a través de un patrón arquitectónico que se basa en la segregación de responsabilidades CQRS. Fue a través de un artículo de Greg Young que me encontré con este concepto. Ahora, sería simple pedirle a las aplicaciones que diseñen, armen y mantengan una segunda estructura de datos (no tanto que lo hagan), y ¿qué pasa con las aplicaciones no desarrolladas por nosotros?, ¿qué pasa con las aplicaciones ya productivas?. Aquí el planteo que nos hacemos es que modificarlas tiene un impacto muy alto o es imposible hacerlo. pero puedo aprovechar puntos de integración como….. eventos. Podemos extender el patrón y delegar la responsabilidad en una aplicación externa. Esta aplicación debería estar enfocada puramente en la consulta y tener la capacidad de escalar fuertemente en ese aspecto. Inconsistencia temporal, es decir podemos tener lecturas durante un período de tiempo. Infinispan es una base de datos en memoria bajo el esquema clave/valor. Su poder reside en la velocidad de acceso a los datos no solo por estar en memoria si no por el acceso directo por clave. El acceso por clave representa una clara ventaja si los servicios que exponemos tienen en cuenta que la clave de búsqueda corresponda con la clave de almacenamiento del dato. Infinispan puede utilizarse como API o como servidor. En esta arquitectura vemos ISPN como un punto de concurrencia de muchas aplicaciones donde una escribe y todas las demás leen. De modo tal que hay una serie de servicios exponiendo la información. Las lógicas de procesamiento de los datos escala con los nodos. No genero carga sobre el ESB o una capa extra para accede a los datos. Problemas, reinicio o deploy de nuevas versiones de la capa de servicios son independientes de la capa de persistencia en Infinispan. Si la aplicación es comercial debemos analizar los puntos de integración que brinde. En caso de no tenerlos existe la posibilidad (aunque desagradable) de implementar un mecanismo de pooling sobre la base de datos (trigger, pooling daemon, etc) que permita informar las novedades. ¿Cómo garantizamos la llegada de la totalidad de las novedades? Podemos hacer que la persistencia en la plataforma de eventos forme parte de la transacción. Podemos definir algún mecanismo de reintento manual o automático para la persistencia del evento. A partir del momento en que tenemos el mecanismo de carga de los datos, la configuración del cluster de datos en memoria es totalmente independiente. Puede ser replicado o distribuido, dependiendo de la cantidad de datos a almacenar, la robustez que pretendamos y los tiempos de rehidratación. El cache store asegura la posibilidad de recuperación ante caída o error en algún nodo o el cluster completo. Normalmente es ineficiente o imposible hacerlo desde el origen. Por más que evalúo alternativas siempre llego a la misma conclusión, la mejor manera de implementarlo es a través de alguna plataforma JMS. El bus debe funcionar como buffer de eventos permitiendo cierto grado de elasticidad a los consumidores y logrando que la persistencia del evento tenga un mínimo impacto en la performance y costo de recursos del productor. Cualquiera sea la alternativa cuanto más podamos garantizar la disponibilidad de la plataforma y su escalabilidad mejor.Esto permitirá soportar el aumento del volumen de mensajería y su tiempo de disponibilidad (availability). Esquema public-subscriber: permite escalar en el consumo de mensajes y permite también la incorporar consumidores sin reiniciar o configurar la infraestructura. Subscriptores durables: garantiza la conservación del mensaje hasta que el consumidor lo tome. Mensajes persistentes: garantiza la permanencia del mensaje aunque se reinicie la plataforma. La estrategia consiste en armar un esquema pub-sub donde un publisher envía un mensaje a un tópico y n subscriptores lo toman. Esto permite escalabilidad en los subscriptores al registrarse con el mismo client-id y al ser persistente nos permite garantizar la llegada del mensaje. La integración de aplicaciones mediante servicios y/o eventos genera problemas de impacto entre aplicaciones. El problema de administrar el impacto de la integración encuentra un buen atenuante en la segregación de responsabilidades. Las bases de datos en memoria y JMS son tecnologías que brindan las funcionalidades adecuadas para la implementación de una arquitectura CQRS y permiten abstraer consumidores de productores y almacenar estructuras de consulta. 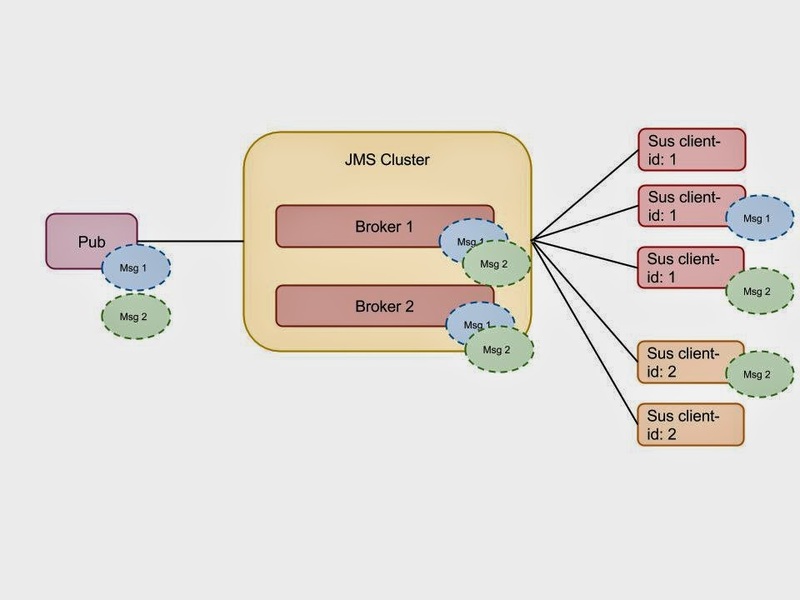 Particularmente mi experiencia con Infinispan para brindar servicios de consulta y JBoss A-MQ para administrar la mensajería ha sido más que satisfactoria permitiendo tener una infraestructura 7×24 con garantía de delivery de mensajes y brindar servicios de alto volumen reduciendo los tiempos de respuesta entre 10 y 100 veces.